SanDisk Crams 128GB on microSD Card: A World First – Carpet Bomberz Inc. This week during Mobile World Congress 2014, SanDisk introduced the world’s highest capacity microSDXC memory card, weighing a hefty 128 GB. That’s a huge leap in storage compared to the 128 MB microSD card launched 10 years ago. via SanDisk Crams 128GB on microSD Card: A World First. 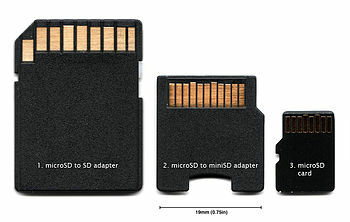 Amazing to think how small the form factor and how large the storage size has gotten with microSD format memory cards. I remember the introduction of SDXC cards and the jump from 32GB to 64GB flash SD sized cards. It didn’t take long after that before the SDXC format shrunk down to microSD format. Given the size and the options to expand the memory on certain devices (noticeably Apple is absent from this group), the size of the memory card is going to allow a lot longer timeline for the storage of pictures, music and video on our handheld devices. Prior to this, you would have needed a much larger m2 or mSATA storage card to achieve this level of capacity. You would have needed to have a tablet or a netbook to plug-in those larger memory cards. My interest in this would be taking a cell phone overseas and going through U.S. Customs and Immigration where it’s been shown in the past they will hold onto devices for further screening. If I knew I could keep 128GB of storage hidden in a metal coin that passed through the baggage X-ray without issue, I would feel a greater sense of security. A card this size is practically as big as the current hard drive on my home computer and work laptops. It’s really a fundamental change in the portability of a large quantity of personal data outside the series of tubes called the Interwebs. Knowing that stash could be kept away from prying eyes or casual security of hosting providers would certainly give me more peace of mind. SanDisk is definitely taking the cards to a whole new level. Before we know it, we will have a terrabyte category for these components. I think you’re right. It’s just a matter of time until they get the right die shrink/ruling size to get the density higher. That plus, they stack multiple chips and laminate them one on top of the other to make them take up less space. It may be a while before we see 1TB, but it will come eventually in in SDXC size and eventually MicroSD.